Terrain Builder is a GLOBE module that builds bottom contours based on incoming depth data or from track or mark files. Terrain Builder can display the data as contours, points or hill shaded relief maps. The data can be colored according to the settings in GLOBE's Elevation Color Bar. Terrain Builder is designed to improve bathymetry in local areas such as fishing grounds or the entrances to harbors, rivers or where there are few or out of date surveys. 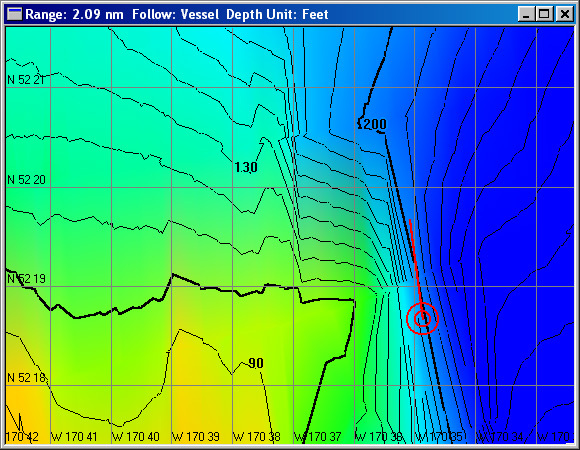 Terrain Builder data can be used with our 3D module to provide a real-time 3D view of the ocean floor. Data can be combined with our existing 3D data or viewed alone.